It was donated to Burlington in 1935 by Katherine McKim Carrison Norton, whose husband, Charles Dyer Norton, a grandson of Dr. Dyer, had once served as secretary to President William Howard Taft. Mrs. Norton had her own ties to the abolition movement. Her paternal grandfather, William Lloyd Garrison, published the abolitionist newspaper, The Liberator. Her maternal grandparents, Mr. and Mrs. James Miller McKim, had accompanied Mrs. John Brown to Harpers Ferry, Virginia, in December 1859 for Mrs. Brown's last meeting with her husband before he was hanged for treason against the Commonwealth of Virginia. The monument was designed by Thomas Hudson Junes, who designed the original Tomb of the Unknown Soldier at Arlington National Cemetery near Washington, C.D. The Dyer Monument was hewn from the same stone. 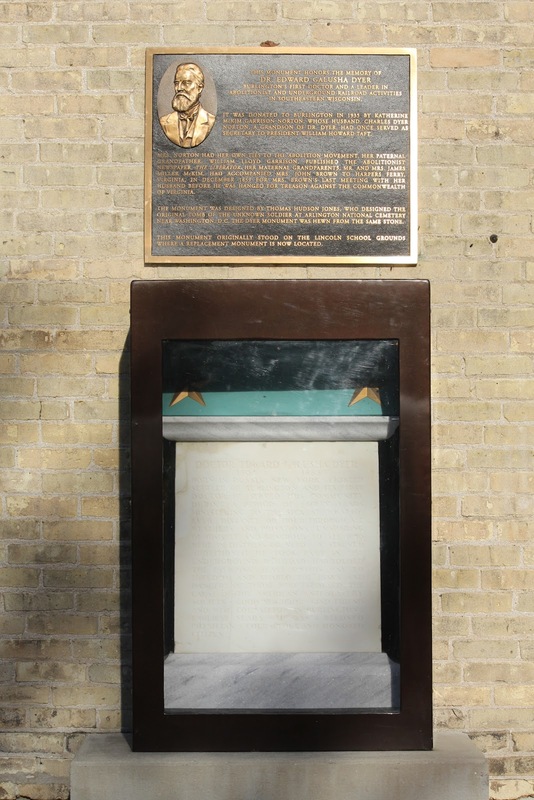 This monument originally stood on the Lincoln School grounds where a replacement monument is now located. 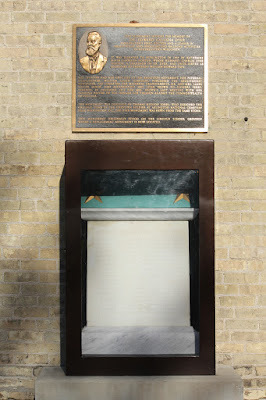 The marker is located on the grounds of the Burlington Historical Society and is accessible from northbound North Perkins Boulevard, just south of its intersection with East Jefferson Street, at or near 232 North Perkins Street, Burlington, Wisconsin 53105.
visible to the right of the entrance. The marker is located in Burlington, Wisconsin.